Last Thursday saw the release of the new Pumpkin Cardigan and Cardi Dress from Cocowawa Crafts, and it could not have been timed better. 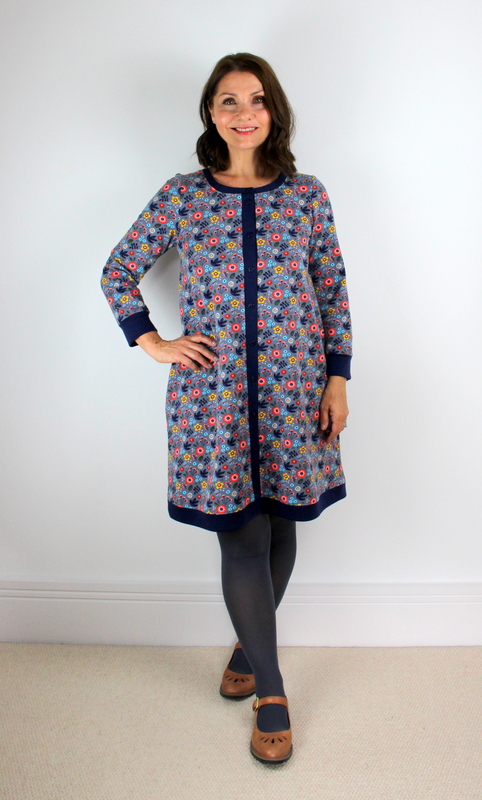 The Pumpkin Cardigan and Dress is a comfortable cosy pattern for knit fabrics, and offers you the choice to make a cardigan or dress using your choice of necklines, sleeves and pockets. You can also add a simple hem or add a ruffle! I am so thrilled to be part of the pattern testing team for Cocowawa, and when I saw this pattern for the first time I knew that I would like to make the dress version. 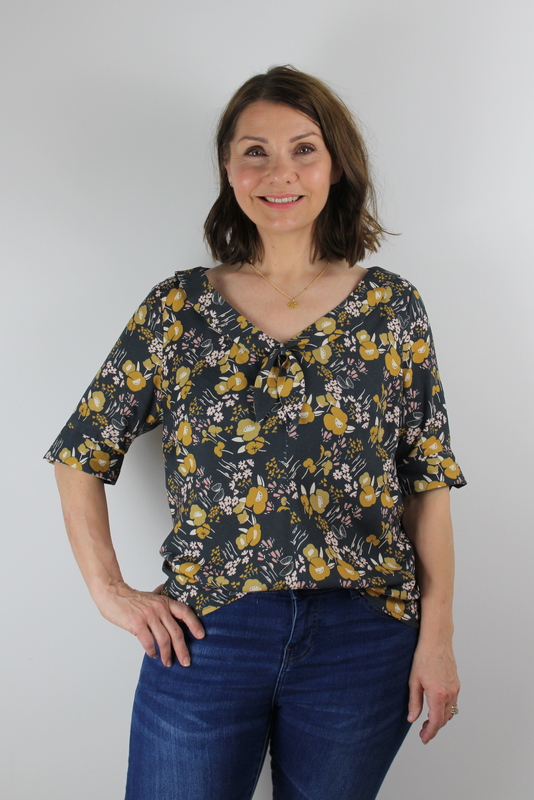 I had recently spotted this gorgeous loop backed jersey in the online fabric shop Material Girl Laura. it is the perfect weight for this project, the quality is excellent and I have since noticed that Laura is now stocking other colours ( check out the ‘sage’ colourway – it’s lush). I teamed it up with a beautiful blue ribbed jersey from Material Magic in Leicester. The colour is a perfect pairing with the dark blue dove in the main fabric and I was thrilled to find such a great match. I went for the scoop neckline, and chose to keep things cosy and make the sleeved version (with cuffs). I also opted for inseam pockets (my favourites), but also love that there is the choice for bound pockets too if that is your preference. Finally I wanted to keep the hem of the dress simple and went for a simple band at the bottom – but a ruffle here is definitely something I will make in the future as it is too cute. Fitting on the dress is easy, although I did make a toile before this finished version, as I always do when pattern testing,to make sure that I had the right size. For me, with this dress, as long as I have the bust measurement correct then the a-line shape of the dress just falls into place perfectly. The result is the most comfortable, cosy dress you could dream of. Pair it with warm tights and flats or boots and you are good to go and Autumn ready! I know that I have already mentioned the pockets, but, well.. they’re essential right? I love that Ana from Cocowawa provides you with the support of a YouTube video for this pattern. So if you feeling nervous about any of the construction techniques or you simply want a pal to sew-along with, then head on over to the video which I have linked above. Having said that, the written instructions are great and super clear and are accompanied by excellent illustrations, but this video certainly provides that little bit extra for those amongst us who like visual explanations. 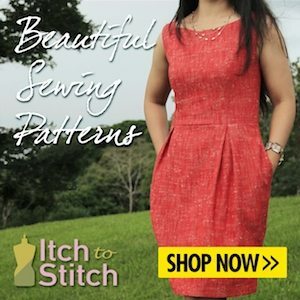 There are quite a few buttons required for this pattern whether you choose the dress or cardi version. You can use regular buttons and buttonholes, add snaps, or like me simply sew your buttons right through all your layers because you discovered that you can easily pull it off and on over your head. Of course, this is only one version of the Pumpkin, and I was blown away when I saw all the other versions that the rest of the pattern testers had produced. It really does highlight the variations in the pattern when you see them all together so I will pop a link in here if you would like to have a browse through for some Pumpkin inspiration. Huge thanks to Ana for allowing me to be a small part of this pattern journey with her. As always, the whole process was a joy, and I am thrilled to share the result with you. I can’t wait to see Pumpkins popping up all over the place now, and look forward to seeing your fabric choices and whether the cardi or the dress is your preference. Don’t forget that the Instagram challenge #cosycardichallenge is running at the moment until the end of November and the Pumpkin Cardi would be just perfect for this don’t you think?